Place of the Battle of Blenheim: On the Danube in Southern Germany. Combatants at the Battle of Blenheim: British, Austrians, Hungarians, Hanoverians, Prussians, Danes and Hessians against the French and Bavarians. Generals at the Battle of Blenheim: The Duke of Marlborough and Prince Eugene of Savoy against Marshall Tallard, Marshall Marsin and the Elector of Bavaria. Size of the armies at the Battle of Blenheim: There is considerable dissent on the size of the respective armies. The French and Bavarian armies probably comprised 60,000 men (69 battalions of foot and 128 squadrons of horse) and around 60 guns. The Allied army comprised 56,000 men (51 battalions of foot and 92 squadrons of horse), of which 16,000 (14 battalions of foot and 18 squadrons of horse and dragoons) were British and 52 guns. There is considerable variation in the numbers attributed to the French and Bavarian armies: some authorities put their strength as high as 72,000 men with 200 guns. French and Bavarians: 43,900 men, in 78 battalions and 127 squadrons, with 90 cannon. (French battalions having 400 men to the Allied 500 and the French squadrons 100 to the Allied 150). Winner of the Battle of Blenheim: Decisively the army of the Duke of Marlborough and Prince Eugene. 3rd Regiment of Horse; later the 3rd Carabineers and now the Royal Dragoon Guards. 5th Regiment of Horse; later the 5th Inniskilling Dragoon Guards and now the Royal Dragoon Guards. 6th Regiment of Horse; later the 3rd Carabineers and now the Royal Scots Dragoon Guards. 7th Regiment of Horse; later the 4th/7th Royal Dragoon Guards and now the Royal Dragoon Guards. Royal North British Regiment of Dragoons, the Royal Scots Greys; now the Royal Scots Dragoon Guards. 5th Dragoons; later the 16th/5th Royal Lancers and now the Queen’s Royal Lancers. In November 1700 Charles II, King of Spain, died leaving his throne in his will to the Duke of Anjou, grandson to Louis XIV, King of France. Louis XIV permitted his grandson to accept the throne of Spain, thereby plunging Europe into a general war. The main antagonists were France and the Austrian Habsburg Empire, whose emperor would not stand by and see the Bourbons absorb Spain. The Low Countries, comprising Flanders and Holland, as in so many wars became one of the main theatres of military operations. The Dutch turned to Britain for troops and money under its treaty commitments and the British Army prepared to join its allies in the Low Countries. In June 1702 John Churchill, Duke of Marlborough took up his appointment as commander-in-chief of the allied armies in Flanders. During the campaigns of 1702 and 1703 Marlborough grappled with the lack of co-operation from his Dutch allies and their apparent determination to avoid full-scale battle with the French armies attempting to overrun Flanders. In 1704 Louis XIV turned away from the Low Countries. He intended this to be a year of overwhelming conquest for the French over the Austrian Hapsburgs. His plans saw the French commander, Marshall Villeroy assuming the defensive in Flanders as an army under Marshall Tallard advanced across the Rhine, another under Marshall Marsin and the Elector of Bavaria moved against the Hapsburgs from the Danube and the French army in Italy attacked through the Tyrol, thereby bringing Austria to her knees and suing for peace. Consumed with anxiety over French intentions Marlborough took the field in April 1704, implementing his scheme to counter Louis XIV’s strategy by taking his army to Southern Germany. Drawing up his plans over the preceding winter and expecting the usual obstruction-the Dutch could be expected to put up fierce resistance to removing the army from the Low Countries-Marlborough revealed his full intentions to only a select few. 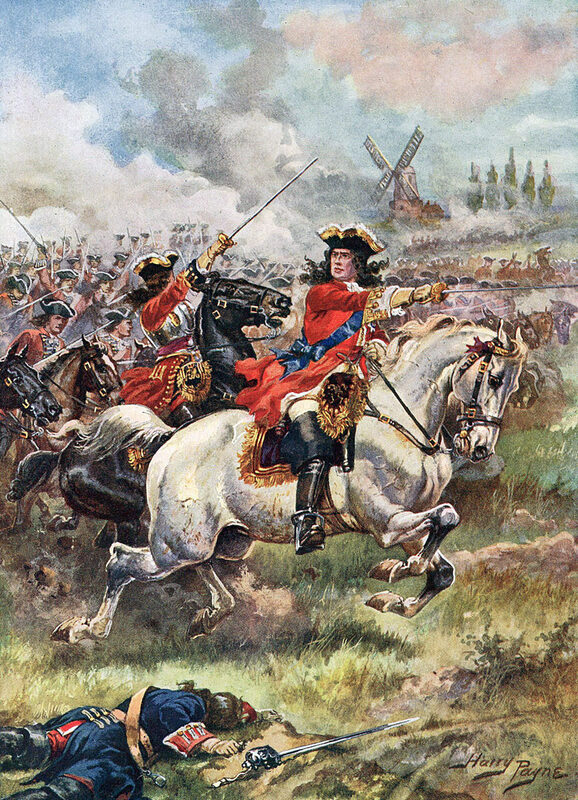 In May 1704 Marlborough began his march south. In early June 1704 he halted in southern Germany to allow his various forces to catch him up; his brother Charles Churchill with the British infantry, Prince Lewis of Baden with the Hessians, Hanoverians and Prussians and Prince Eugene of Savoy with the Imperial troops. Prince Eugene marched on to block any French attempt to cross the Rhine while Marlborough and Prince Lewis moved against the Elector of Bavaria, positioned on the Danube and barring entry into his country. On 21st June 1704 British and allied troops stormed the position known as the Schellenburg held by the French and Bavarians, forcing the Elector to retire into the fortified city of Augsburg. The French general Marshall Tallard marched south to reinforce the Bavarian and French troops, meeting the Elector north of Augsburg. Prince Eugene hurried to join Marlborough on the Danube, arriving at Hochstadt. These generals made their rendez-vous on 26th July 1704. On 29th July 1704 Prince Eugene received the alarming news that the French and Bavarian armies were crossing the Danube some three miles to the west of his position. He hurriedly moved east to the Kessel River, a tributary of the Danube, sending urgent requests for support to Marlborough, still marching up to the south bank of the Danube. On 31st July 1704 Marlborough’s army crossed the Danube at Donauworth, turned west to cross the Wornitz and marched to join Prince Eugene on the Kessel tributary of the Danube. The combined army of Marlborough and Prince Eugene was now some 5 miles short of the French and Bavarians. Tallard’s army held a position stretching north from the village of Blenheim on the Danube. Tallard, Marsin and the Elector had no expectation that Marlborough and Prince Eugene would seek battle against their more powerful army, well positioned behind the marshy Nebel, with its flanks secured by the Danube and the fortified village of Blenheim on the right and the fortified village of Lutzingen and rising hills on the left. Their expectation was that the British and their allies as they ran short of supplies would retire north without a fight. Marlborough and Prince Eugene planned otherwise. The axis of Tallard’s position was Blenheim with its garrison of 26 battalions and 12 squadrons. Marsin and the Elector concentrated the strength of their separate army protecting the villages of Lutzingen and Oberglau; 22 battalions and 36 squadrons masking Lutzingen on the far left. Positioned forward of the line the hamlet of Oberglau was held by 14 battalions including the three Irish regiments in the French service. Between Oberglau and Blenheim, where the division fell between Tallard’s army and the army of Marsin and the Elector, lay 80 squadrons of horse and 7 battalions of foot. If an attack had been expected it may be that more troops would have been moved out of the villages into the intervening ground. The lack of infantry and a unified command at this point was to prove fatal for the French and Bavarians. On the evening of 1st August 1704 the Duke of Marlborough and Prince Eugene studied the terrain between the armies from a church steeple. They saw that the ground was cut by a number of tributary streams flowing North West to South East into the Danube and that the village of Blenheim lay beyond the point where one of the streams, the Nebel joined the main river. The French and Bavarian troops were encamped on the ground behind the Nebel between Blenheim and Lutzingen, a distance of some 2½ miles. The road from Donauworth to Dillingen passed through Blenheim, crossing the Nebel by a stone bridge now partly destroyed. At 2am on 2nd August 1704 the British and their allies broke camp, crossed the Kessel stream in eight columns and began their advance against the French and Bavarians. Once on the plain the army formed up with the cavalry in the centre and the infantry on the flanks, the ground by the river being unsuitable for mounted action. The artillery column wound its way along the highway. With one third of the approach march completed a further column of infantry formed on the bank of the Danube comprising among other nationalities 14 British battalions. Command of this column fell to Lord Coutts. As Marlborough’s army approached the French lines Prince Eugene marched his Imperial contingent away to the right to make his attack on the Elector’s Bavarians. At around 6am the first skirmishes of the battle took place with the French pickets driven in. It was a foggy morning and in spite of the fights between the cavalry vedettes Marshall Tallard remained convinced that Marlborough was on the march north to restore his lines of communications, not seeking a general action. Many of the French and Bavarian cavalry regiments were dispersed across the countryside on the perennial chore of gathering forage for their horses. At 7am the fog lifted revealing to the French commanders the attacking army deployed on the far side of the Nebel River, just half a mile distant. Drums beat, trumpets sounded and the cavalry foragers were hastily recalled as the regiments formed up and the artillery bombardment began. “Salamander” Coutts’ column of British and German foot moved forward on the extreme left, preparing to attack Blenheim while in the centre Marlborough’s engineer officers repaired the stone bridge over the Nebel and threw five pontoon bridges across the stream for the passage of the attacking columns. Coutts advanced with his contingent in six lines; Row’s British Brigade followed by a brigade of Hessians, Ferguson’s British Brigade, a brigade of Hanoverians and two further lines of foot. Marlborough deployed the rest of his force away to the centre and right in four lines; foot, cavalry, foot and then again cavalry. On the extreme right Prince Eugene hurried to complete his extended deployment against the Bavarian flank, finding his movement impeded by the irregular nature of the ground. At 8am the French artillery opened fire returning the bombardment from the British and German guns. Marlborough waited impatiently for news that Prince Eugene’s Imperial troops were in place so the attack could begin. At 12.30pm Prince Eugene reported that he was in place and ready and Marlborough ordered Coutts to assault Blenheim. By 1pm Row’s Brigade of 1st Guards, 10th Foot, 21st Foot, 23rd Royal Welch Fusiliers and 24th Foot were advancing on the village under heavy fire. The British Foot was ordered not to return the fire, so as not to delay the advance, until the brigadier himself struck the first fortification. The Foot was then to storm the village at the point of the bayonet. Memorably Brigadier Row stuck his sword into the wooden barricade and was promptly shot down together with his staff and around one third of his battalions. As the remnant of the brigade fell back they were charged in flank by the French Gens D’Armes, who were in turn repelled by the following Hessians. At Coutt’s request five squadrons of British Horse and Dragoons came up on his left, struggling across the Nebel and repulsed the Gens D’Armes with a charge. Ferguson’s British Brigade of Foot resumed the advance with the remnants of Row’s Brigade. Storming into the outskirts of Blenheim they engaged in hand to hand fighting with the French Foot but were unable to make further progress into the village. On the right centre the Prince of Holstein-Beck launched his infantry assault in the direction of the fortified village of Oberglau. Holstein-Beck led forward the German Brigades of Wulwen and Heigdenbregh, but had considerable difficulty crossing the Nebel stream, here closely defended by French Foot positioned behind the stream, well forwarded of the main French position in Oberglau. Four battalions managed to cross the Nebel including Benheim’s and Goor’s Regiments, only to be attacked by several battalions of foot from the Oberglau garrison. The two German regiments were nearly annihilated. Conducting the assault were Irish Regiments in the French service (the battalions of Lee, Dorrington and Lord Clare) with the French Regiments of Champagne and Bourbonnois. The Prince of Holstein-Beck was severely wounded and some 2,000 Allied soldiers captured during the attempted assault on Oberglau. No real progress was made in taking Oberglau and the hamlet held out until the collapse of Tallard’s army brought about the precipitate retreat of the French and Bavarian left wing. Further to the Allied right Prince Eugene struggled to maintain his position against the Elector of Bavaria, three vigorous attacks being beaten back by the Bavarian troops, also positioned well forward on the edge of the Nebel River. In the centre of the battlefield Marlborough’s main force crossed the Nebel, the first line of foot followed by a second line of cavalry. Tallard launched his horse on the British cavalry, disordered after the troublesome river crossing. The British were relieved by the counter attack of the Prussian cavalry of General Bothmar, driving the French back from the stream. In spite of the setbacks in the attacks on Blenheim, Oberglau and Lutzingen, the French and Bavarians in the three villages were contained sufficiently to enable Marlborough to bring the whole of his cavalry force across the Nebel and launch them at the French troops positioned in the open ground between Blenheim and Lutzingen, the site of the join between Tallard’s and Marsin’s commands. Marsin’s regiments fell back towards their infantry in Oberglau leaving Tallard’s force isolated and exposed. In the face of a further mass charge by Marlborough’s squadrons, Tallard’s cavalry fled behind Blenheim and on towards the River Danube. In the confusion Marshall Tallard was wounded and captured and many of his men drowned in their attempt to escape across the Danube. Marsin and the Elector, witnessing the collapse of Tallard’s army set fire to Oberglau and Lutzingen and retreated precipitously to the North West. Marlborough’s troops swept around the rear of Blenheim surrounding the large French garrison. Charles Churchill, Marlborough’s brother was preparing to assault the village when the French proposed a parley. The French sought terms that would enable their regiments to leave with honour but only complete submission was acceptable and 24 battalions of French Foot with 4 regiments of dragoons surrendered to Marlborough, the Regiment of Navarre burning its colours rather than deliver them to the British. The overthrow of the French and Bavarian army was absolute. Casualties at the Battle of Blenheim: Total allied losses were 12,000 killed and wounded. Of these, British casualties were 200 officers and 2,000 soldiers. French and Bavarian casualties were 40,000 killed, wounded and captured. Marshall Tallard went into captivity in England. The French lost 11,000 prisoners, including 2 generals, most of their guns, 129 colours, 171 cavalry standards and the whole of their camp. Follow-up to the Battle of Blenheim: The immediate result of Blenheim was the collapse of Louis XIV’s assault on Austria. The war continued for some years in Flanders, but Louis XIV’s grand strategy was thwarted. At the order of Queen Anne a medal was struck to commemorate the battle. The house built by the Duke of Marlborough at Woodstock in Oxfordshire is named Blenheim Palace after the battle. One of the regiments in Brigadier Row’s brigade was his own regiment, the Royal North British Fusiliers (21st Foot-later the Royal Scots Fusiliers). When Row fell, shot down as he stuck his sword in the French ramparts, his two field officers, Lieutenant Colonel Dalzell and Major Campbell, rushed to his assistance only themselves to be killed. The regiment lost all three senior officers along with an unknown number of other officers and soldiers. Creasy’s Fifteen Decisive Battles of the World.